A Two-year-old was taken to the hospital Sunday in Scotland County after being found unresponsive from ingesting a combination of fentanyl and heroin. 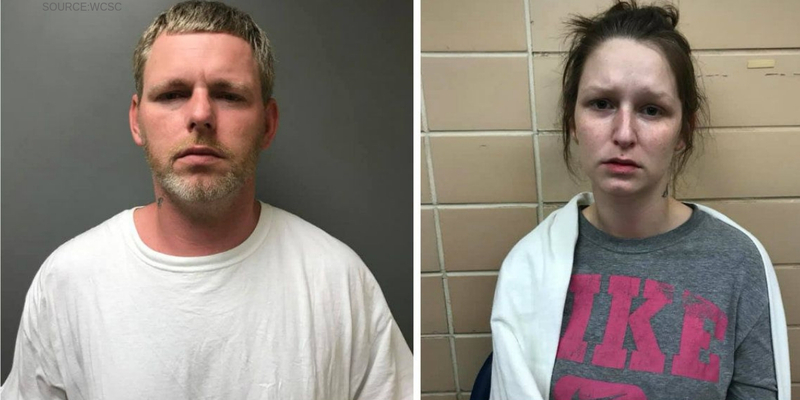 According to authorities 34-year-old Thomas Scott Ivey Sr. and 27-year-old Caitlin Sessoms were both charged with two counts each of felony child abuse by negligence resulting in serious bodily injury and felony child abuse by negligence resulting in serious physical injury. Both parties have received a secured bond of $500,000 and are scheduled for a first appearance on Monday. The current investigation is ongoing. Authorities obtained a search warrant for the residence of Ivey and Sessoms in the area of McFarland Road, a number of items were seized as evidence. Reports claim Ivey and Sessoms will be charged on additional charges regarding possession of a schedule I and II narcotics, related to MDMA, “ecstasy”, and heroin. The County Sheriff’s department explains in detail the purpose of creating arrest reports, solely to share information with the local communities in hope to spread awareness and teach others of the consequences involved with certain actions. They added, “We would be failing if we did not do this for our identified victims and especially when they are children and we encourage them to report crimes committed against them.” The investigation is still ongoing. The Recover is an unbiased substance abuse and mental health news provider. Helping individuals looking for the right treatment programs in their area. Also providing information on North Carolina drug rehab centers for addiction recovery.